As Marketers, we strive to write valuable content, stand out from our competitors and target our audience in a unique and creative way. Leveraging social media is a great way to achieve all three of those goals. However, if you or your client is a home builder or involved in interior design, it might be challenging to know what exactly to post and how to differentiate yourself from other brands. Check out these 10 home builder brands that found creative ways to leverage social media. Social media is best for just that: being social. Lennar Homes is the perfect example. Their Facebook page is personal – it’s not just beautiful pictures of amazing homes. 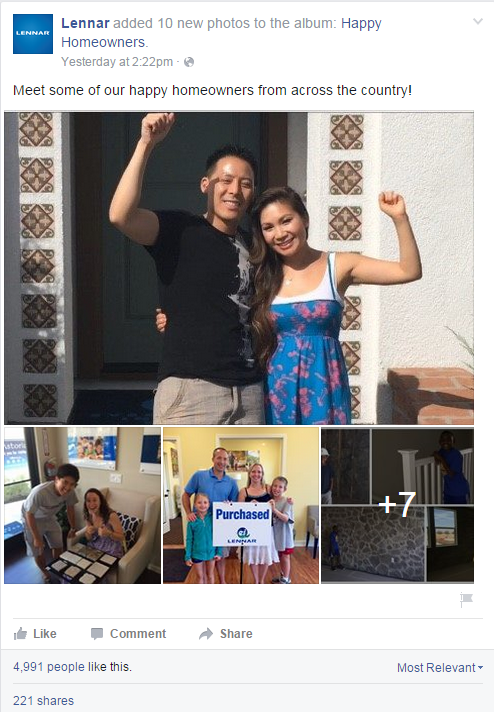 They share pictures of first-time homeowners and other big milestones. Not only can this increase their reach by tagging people and accordingly showing up in more relevant newsfeeds, but it also increases engagement. Neuromarketer Martin Lindstrom is willing to bet that “90% of all decisions are made subconsciously” with our emotions and seeing pictures of happy families elicits emotions way more than a picture of a beautiful spiral staircase ever will. Social media offers companies the unique opportunity to give behind the scenes looks and sneak peeks to those who opt to follow them. This is an incentive, initially, to follow the company. The more a user views this social media platform, however, the more the company gains a sort of brand leadership relationship with the potential client. 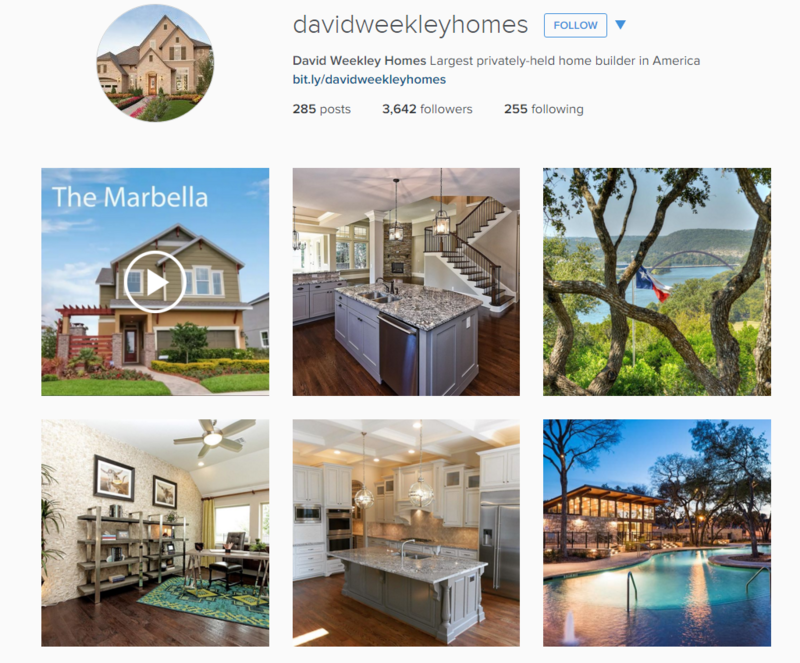 David Weekley Homes does a great job of using not only images of the homes they build but also scenery of the area and a quick video tour of a recently built home. This adds another level of helpfulness and intrigue to potential clients viewing their profile. According to Social Media Today, “online video has proven to be the most engaging and compelling form of content for social media users who watch and share thousands of them every single minute” — you don’t want to be missing out. Another advantage to social media is the ability to connect with potential clients on a more meaningful level. 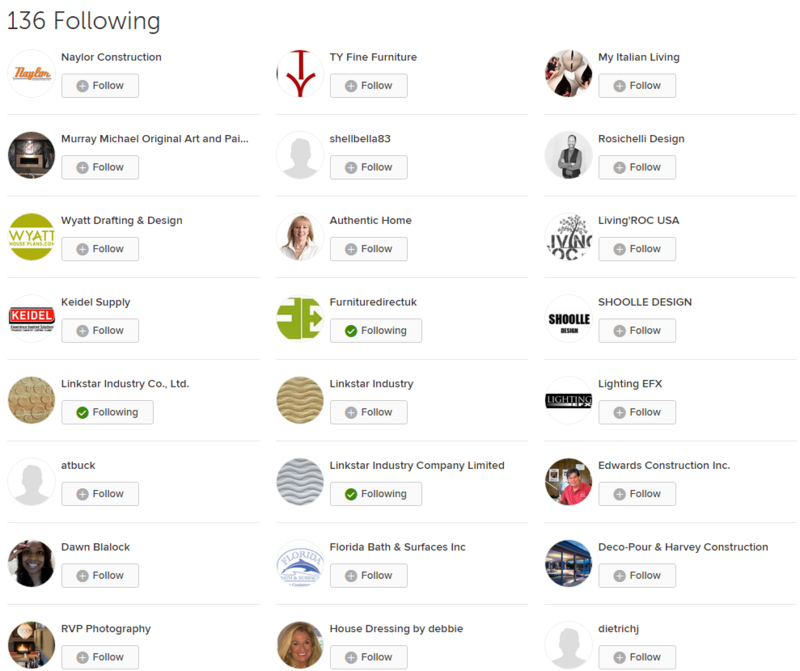 On Houzz, for example, a home builder can follow anyone who is following them. This creates an opportunity to gain insight into what other information that user has available on Houzz and also to open a dialogue. Fischer Homes, for example, is following not only design studios and construction companies. They are following homeowners. With this simple strategy, Fischer Homes is able to collaborate on projects with people who are openly creating project boards on Houzz — practically begging for a remodeler or home builder to reach out to them! Looking for a great example of how to engage on Twitter? 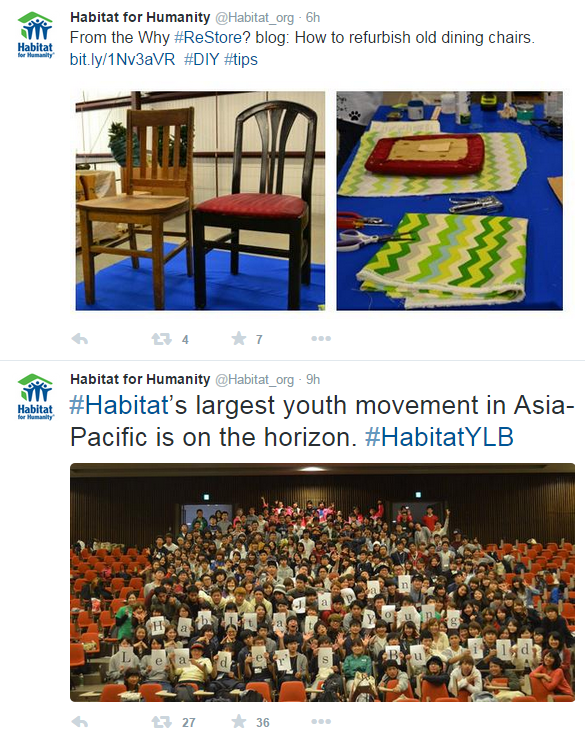 Check out Habitat for Humanity International. It’s easy to shoot out a couple tweets and cross your fingers that you’ll become an overnight sensation. But unless you’re Lady Gaga, this probably won’t get you very far. Habitat is great at using hashtags to draw already interested viewers in, posting correctly sized images for these viewers to connect with and relate to, and then a link to their blog to pull people to their website. According to Buffer, “tweets with images receive 18% more clicks, 89% more favorites and 150% more retweets.” The ultimate goal of social media is to pull a potential client to your website to learn more about you and why you are the right decision for them. Habitat for Humanity International does just that. Another great way to engage with people through Facebook is by responding to their comments. Think of it this way: each person who engages with something you post on social media is the same as someone engaging with you in person. If someone told you they loved a fireplace you designed to your face, would you reply? Treat social media as an opportunity to have conversations with people you may not reach on a daily basis. 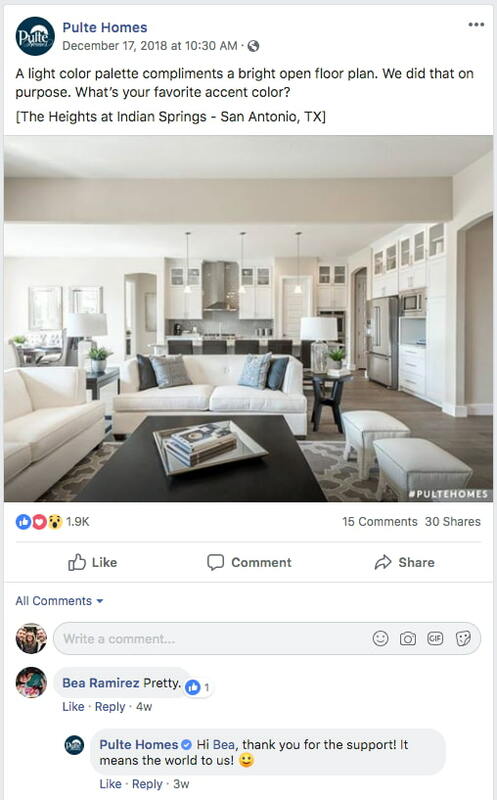 Pulte Homes does a great job of interacting with anyone who comments on their Facebook page, developing relationships and trust with each touch. Pinterest is a largely untapped platform that offers the opportunity to reach an estimated 100 million users searching for pictographic ideas, inspiration, and information. In the home building and remodeling industries in particular, this is the perfect place to showcase some of your finest work. Beyond just posting your own work, however, Pinterest is an excellent way to interact directly with users who are “pinning” on boards for their own upcoming projects. You can also remain relevant by pinning images of upcoming holidays (for example, Thanksgiving decorations or recipes). Keeping up with what’s trending will help you get noticed by those looking for trending topics. Wallmark Custom Homes does a great job of creating relevant boards with trending topics and resonant boards with their own images from projects. Another way to interact with users on Houzz is through responses to comments. 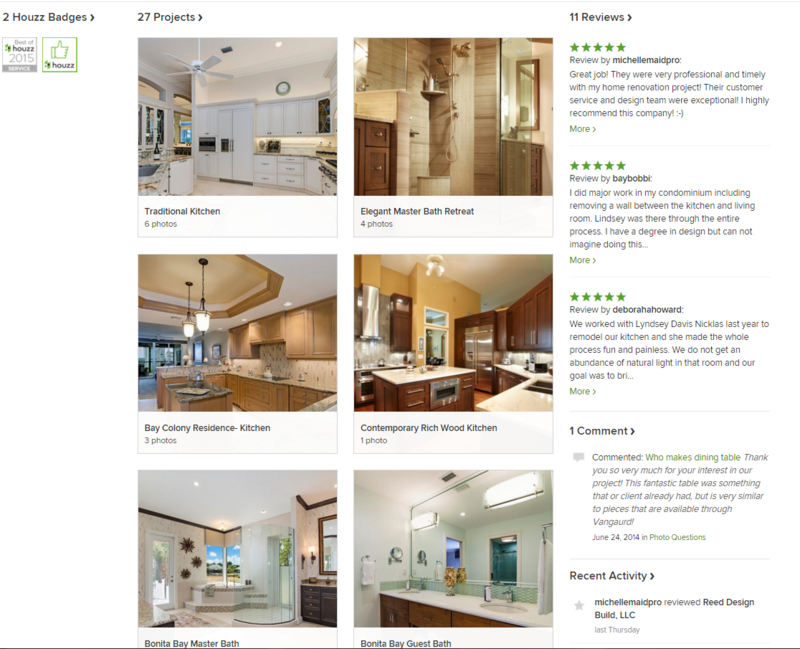 Houzz is like the love child of Pinterest and Facebook — it lends itself to building interactive projects with users as well as comments and rating. Reed Design Build does an excellent job of responding to comments and garnering reviews. Both show not only how much they care about their potential clients by answering their questions but also how much they care about their past customers by collecting several 5-star ratings. Pinterest can be a tricky platform to remain sticky. Without someone directly seeking out your brand in the search, it can be a challenge to put out content that will be found. Take a page out of Shea Homes’ book. This home builder produces several boards pertaining largely to relevant and trending topics in an effort to remain top of mind for those searching for related topics. Once they draw someone to their profile, however, they have several powerful boards outlining their brand. One board is even filled with pins to their own blog, spanning over 75+ topics of interest for home buyers. 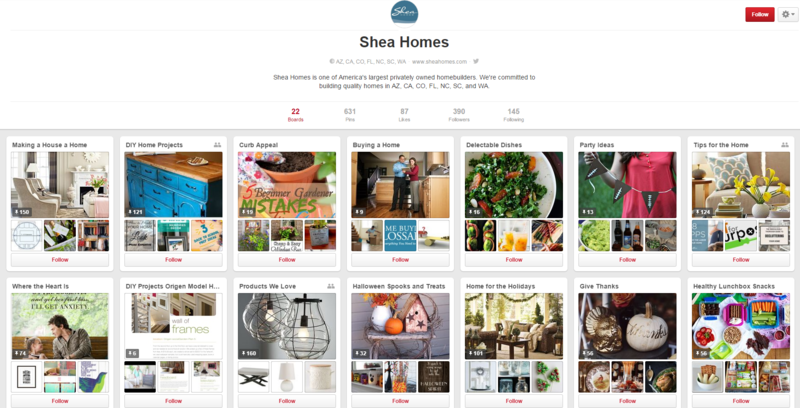 Shea Homes is harnessing the power of external links to build their SEO and increasing the number of places they can be found by potentially interested customers with their Pinterest strategy. According to Moz, “Top SEOs believe that external links are the most important source of ranking power,” so this is not a strategy to be overlooked! Instagram might not be your top-product-selling platform as a Marketer, but it just may be your top-brand-selling platform. This app gives you unique experience of connecting with your audience in a visually captivating manner. 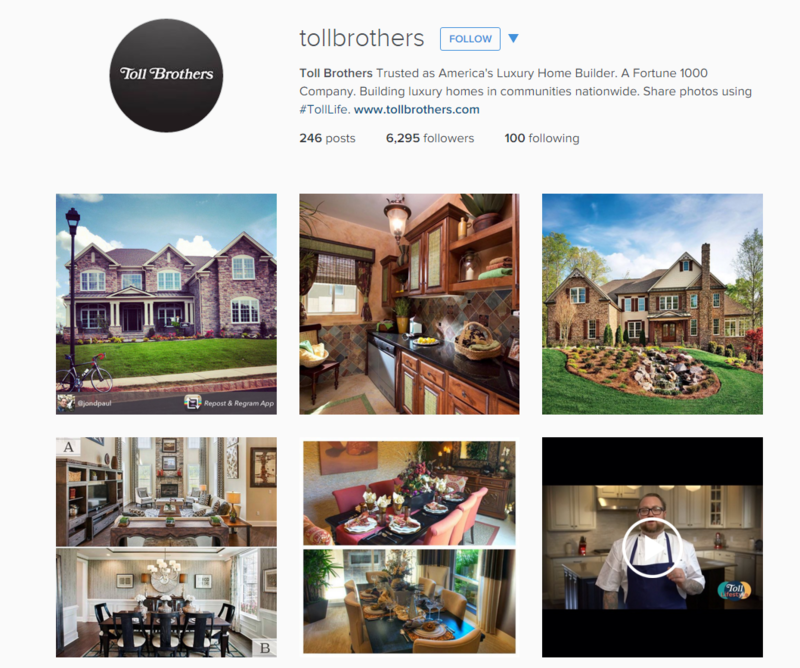 Toll Brothers is particularly strong on Instagram, utilizing not only a hashtag (#TollLife) but also the regram capability to discover when people are talking about them and to then highlight these shared images. This brand cleverly takes the hashtag to the next level; when someone posts a picture on Instagram with their hashtag, Toll Brothers reposts (“regrams” for all you fluent Insta-tongues) the picture on their own profile as a feature. This strategy generates excitement around the brand and around producing powerful photography surrounding the brand. Some might call this free marketing and publicity, actually, by letting those using the brand speak for themselves. So, I mentioned hashtags. Let’s talk about them. Drees Homes is hitting this strategy out of the park! By inviting anyone who encounters their brand to use the hashtag #LivingTheDrees, Drees Homes is not only showcasing their creativity in hashtag development but also their commitment to starting a conversation around their brand. With continual upkeep, Drees Homes manages to keep their hashtags relevant and fun, including #HappyHollyDrees for the holiday season for example. I wish I lived in a Drees home just so I could interact on their online community with all of their fun hashtags and customer features! And, according to Sprout Social, ” Seeing as how they’ve been integrated into most of the popular social media platforms, and social media has entered almost every facet of our lives,” hashtags are here to stay. So, #EmbraceTheHashtag! Social media strategy is not something that works alone in a vacuum. Each platform has a unique audience and should accordingly be treated as a different opportunity. In building your social media strategy, keep in mind that it takes continual upkeep and honing, and that it works best with a comprehensive marketing plan to get the most out of each touch point. 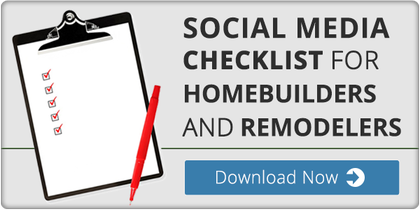 Starting a social media strategy for your own home building or remodeling business? Check out the free ebook below.